For an employee to be engaged, there needs to be a few core things that are taken care of. There are 10 essential things that companies need to keep in mind when trying to improve employee engagement. of employees feel like they don't get enough praise. According to the book How Full Is Your Bucket1, the number one reason people leave their jobs is that they don’t feel appreciated. Not getting recognition for your work when you know you deserve it is one of the most frustrating things that can happen in an organization. Recognizing your employees is one of the most important things you can do to increase retention and lower turnover. lower voluntary turnover for organizations that give regular recognition. Turnover is expensive and engaged employees are hard to come by, meaning you need to do everything you can to keep your best people around. After understanding how important recognition is, it’s surprising what we’re finding in our research. How often do you usually get praise? Our research shows that employees are not getting nearly enough praise as they should. of employees get praise less than once per week. That number is way too high. Too many employees are walking around feeling like their organizations are ungrateful. One of the things that lead managers to avoid recognition is that they often confuse recognition with physical rewards. Recognition is simply the acknowledgment of a job well done. You don’t need to spend a penny on recognition. of employees think it's better to give someone praise than a gift. This is great news for managers. Recognizing employees for a job well done is one of the easiest (and least expensive) ways to motivate them. Learn everything you need to know about employee recognition and how to implement it in your team with this complete guide. of employees have to wait more than 3 months to get feedback from their manager. Feedback is one of the most important parts of growing as an employee. Most managers don't enjoy giving feedback, but it turns out that employees love receiving it. Feedback is all about changing behavior, and the closer you give feedback on the behavior you want to be changed, the more likely it is to change. If you wait until an annual performance review to give feedback, that’s way too late, it’s already forgotten about. of employees said that receiving feedback regularly is a good thing. This is a huge opportunity for managers to develop their employees. Monthly one-on-ones, weekly planning sessions, daily check-in meetings are ways that you can give more regular feedback. Another interesting insight that we uncovered was how receptive to feedback employees are. While most managers hate giving feedback, employees are actively looking for it. of employees really appreciate receiving feedback, regardless if it’s positive or negative. They just want feedback in order to get better. Clearly, managers have a huge opportunity here to create more of a feedback culture. It’s not only managers that should be giving feedback. It’s important to create a culture of feedback in your organization where everyone is helping everyone get better. Feedback often means more when it comes from coworkers because they understand your day-to-day better than most managers. of employees wish they received more feedback from their colleagues. Encourage everyone to give each other more feedback and to give their managers more feedback. You’ll see a lot of success if you create a culture of open and honest feedback. More important than the act of giving feedback, is making sure that it's high quality. High-quality feedback is specific, timely, and actionable. On a scale from 0-10, how valuable is the feedback you receive? of employees think the quality of the feedback they receive should be improved. Managers have to practice giving more meaningful feedback to their employees. When we asked managers if employees had acted on feedback they'd gotten, not all of them said yes. Want To Give More Meaningful Feedback? A Manager’s Guide To Giving Employee Feedback will teach you the science behind giving feedback, how to have better performance reviews, and how to set meaningful goals for your employees. of employees leave work feeling drained or very drained. Every Day. It turns out, according to our research, that not many people are happy at work. And happiness outside of work is important to look at too. Without getting too personal, showing an interest in how an employee is doing outside of work is a nice thing to do. of employees aren’t very happy outside of work. As a manager, you should ask yourself what you can do to make someone happier. Even if it’s something outside of work, understand that their happiness outside of work will affect their happiness at work, so it’s worth it. Want To Increase Employee Happiness? Discover the one (free) employee perk that you could implement at your company right now that’s guaranteed to increase happiness. of employees believe that they don’t have any career advancement opportunities. While companies are starting to understand the importance of autonomy, mastery, and purpose, there is still clearly a lot of work to do. Employees feel like they don’t have enough autonomy, they’re not mastering their skills, and they don’t fully feel a sense of purpose. On a scale from 0-10, how much autonomy would you say you have at work? of employees feel like they don’t have enough autonomy. This is likely due to micromanagement. At the end of the day, it all comes down to trust. You need to trust your employees enough to let them run with projects. According to our data, we see that organizations aren’t helping their employees enough to learn and grow. of employees say they haven’t improved their skills significantly in the past year. It’s so important for an employee to understand why they do what they do. Employees are motivated by a sense of purpose and feeling like they are part of something bigger than themselves. Do you believe in the bigger vision of your organization? employees are either indifferent or don't know much about their company's mission. Everyone should know what their company’s mission is. And if an employee is indifferent to it, then maybe they don’t understand why it’s so valuable. Want to grow into a better leader? This 11-day email course will teach you everything you need to know about how to be a better leader. of employees don't see themselves working at their company one year from now. There are two sides to employee satisfaction. The first, is compensation (salary + benefits), and the second, is their overall work environment. Employees need to feel like they’re being fairly compensated for the work they do, otherwise they’ll be disengaged. In psychology, this is known as the equity theory. Does your organization offer a benefits package that you're satisfied with? 1 out of 2 employees isn't satisfied with the benefits package that they have. Are you being paid fairly for what you do? of employees don't think they are paid fairly for their work. Clearly something needs to be done. If salary isn’t something you can change, there are ways to offer benefits like more flexibility to compensate. Onboarding is one of the best opportunities for managers to get their employees integrated into the team and get them productive quickly. According to the book The First 90 Days3, it takes three months before an employee starts adding value. Unfortunately, most onboarding processes last about a day or two, when in reality it should be lasting months. Does your organization have a great hiring and onboarding process? of employees think their company's onboarding process could be improved. There needs to be more emphasis on team building, learning, and training for a longer period of time. Employees need to have clarity around what they do on their day-to-day. They need to clearly understand how you’re judging their success or not. A lack of clarity brings confusion, which leads to stress, which leads to disengagement. What we see is that employees need their managers to define clearer goals for them. of employees think their manager could define clearer goals. Using a tool like Objectives and Key Results (OKRs), where you set team and company goals for the next three months is a great way to ensure clarity around goals. Check in on the progress frequently (ideally every two weeks) to make sure everyone is on track. What's the one thing employees like the most about their job? Get this simple guide to learn how you can set more meaningful and powerful goals for your team. of employees notice that their job is taking a toll on their personal life. There is a serious crisis going on in terms of employee wellness. Employees are stressed, overworked, and don't have a good work-life balance. Most nights, do you get a full 8 hours of sleep? of employees are either constantly sleep-deprived or tend to lack some sleep. That fatigue leads to unhealthy choices, higher stress levels, and lower overall wellness. The amount of time and energy that employees waste being stressed about their work is causing them to be less productive than they could be. As a manager, you should be doing everything you can to reduce the stress from employees. of people consider themselves stressed at work. That number is staggering. There should be no reason why employees are that stressed at work. of employees are worried that they might lose their job in the next 3-6 months. Managers need to reinforce work stability to lower stress levels of employees. There’s no point in overworking your employees. Short term, you might get a few more hours of productivity out of an employee, but long term, overworking someone doesn’t help their productivity, and worst case can lead to burnout. Do you often take work home to complete? Work-life balance is an incredibly important part of being a healthy, happy, and productive worker. of employees think they could improve their eating habits. Download these 6 simple and free ways to give your employees more work-life balance and start having productive, healthy employees. of employees wouldn’t recommend their organization as a good place to work. The employee Net Promoter score (eNPS) is one of the best measures of loyalty and happiness. It looks at the willingness of employees to recommend your organization and its products/services. How likely employees are to recommend their organization as a place to work. How likely employees are to recommend their products/services. The way you calculate your score is by subtracting the percentage of “detractors” (people who score 0-6) from the percentage of “promoters” (people who score 9 or 10). People who score 7 or 8 aren’t included because they’re seen as being neutral. We continuously measure the eNPS from thousands of organizations all over the world, and have found some interesting insights. We found that the average eNPS is 23, which is considered a good score. On a scale from 0-10, how likely are you to recommend our products/services? Globally, this scored a 00, which is an excellent score. People are more likely to recommend their company’s products than the actual culture itself. Want More Employees As Ambassadors? Learn everything you need to know about the employee Net Promoter score and how you can use it to increase employee loyalty. of employees wish their manager communicated more frequently with them. Managers are missing out on an incredible opportunity to develop closer relationships with their employees. of employees say they don’t feel close with their manager. The relationship between an employee and their manager has a huge effect on employee engagement. 1 out of 5 employees feel like their manager isn’t transparent with them. As a manager, you need to create an environment where employees feel comfortable and everyone gets along well with each other. Building those relationships will lead to more engaged and productive employees. Employees want to become closer with their managers because it will make them feel more connected to their organization. We asked employees if they had ever spent time with their managers outside of work and more than a third said that they hadn’t. But interestingly, of those who never spent time with their managers outside of work, a massive 00% of them said they would actually want to. of employees say they’d like to spend more time with their manager. Employees want to get to know their managers and build a closer relationship with them. Want to Improve Your Relationship With Your Employees? Download this complete guide on what makes a good leader and learn how you can be a leader that employees admire and respect. of employees don't think they have enough social interaction with their colleagues. Having a friend at work is one of the most important parts of being engaged and satisfied with your career. But sometimes when we’re stressed or tired, we might be mean to our coworkers without even realizing it. Have you ever seen one of your coworkers be mean to someone else? We see that employees, whether they realize it or not, are being mean to each other. of employees have seen one of their coworkers be mean to someone else. That’s about 1 out of every 2 employees. That’s an insanely high number. One of the reasons why employees feel like they don’t have enough social interaction with their colleagues is that they simply might not have the time. of employess eat alone at their desk working. Another indication that this could be a sign of them being overworked is we also found that 20% of employees wish their colleagues contributed more. There are two things that managers can do to alleviate this. It’s important that you encourage your team to get to know each other. Organizing team building activities or other events to create those social interactions is a great idea. Also, employees shouldn’t be feeling overworked or that their colleagues don’t contribute enough. As a manager it’s your responsibility to ensure that everyone is doing their fair share and that everyone has a good work-life balance. On a scale from 0-10, how much do you value your colleagues' input? of employees highly value their colleague's input. A simple idea to fix these issues is to create more opportunities for employees to work on projects together. As we can see, employees feel that they don’t interact enough with each other, they feel like others should contribute more, but they highly respect their coworkers. Creating teams to allow employees to work more closely together is an easy way to fix all of this. Discover the 11 reasons why employees need to have good relationships with their coworkers and how it affects their productivity, happiness, and their careers. of employees don’t believe their company’s core values align with their personal values. Many organizations talk about the importance of culture fit and how that leads to higher engagement. A perfect culture fit happens when an employee’s personal core values align well with the organization’s core values. Companies need to be doing a better job of preaching the mission and core values of the organization. Employees need to be constantly reminded of why they do what they do. Remember, there is no such thing as too much communication. How often are you reminded of the organization's mission? of employees aren’t reminded of the mission often enough. It’s important for employees to feel like they’re doing something bigger than themselves. For example, if someone works at a pharmaceutical company, they’re not just selling pills, they’re saving lives. That bigger mission is important to keep remembering if you want employees to get passionate about their work. We see similar results when asking employees about the organization’s core values. of employees either don't understand their core values or simply don't know them. This is a huge opportunity for managers to make sure that everyone is aligned, passionate, and working towards the same mission. Are Core Values Just Fluff? Many organizations will have values like “innovative”, “collaborative”, or some other vague word. But do those words really mean anything? Or are they just marketing tools? How much do you think your company's core values help you succeed? Ask yourself if your values actually mean anything or if they’re just there because they sound good. Your core values will help you grow. Read this short guide to learn exactly how to define your core values and create a purpose-driven company. Want to save this report for later? Feel like sharing it with a colleague as a PDF? No problem. Just download the report right now and read it when it's convenient for you. 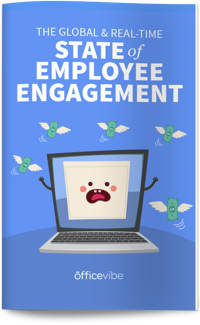 The State of Employee Engagement report was created using answers from a sample of approximately 50,000 users of the Officevibe’s employee engagement software since 2013. That represents approximately 1,200,000 data points. All of the questions come from Officevibe’s survey software library of questions. This represents a total of approximately 350 questions, though not all of the questions were used in the creation of this report. Each week, employees answer 5 questions via email chosen from Officevibe’s library of questions. The selection is based on our proprietary algorithm to maximize participation and metric coverage for any given period. The answers used to generate this report come from approximately 150 countries. The countries with the largest amount of data considered are the United States, United Kingdom, Canada, India, Australia, South Africa, Germany, France, Netherlands, Sweden. The answers used to generate this report come 1,000+ organizations from all the different types of industries listed in the Industry Classification Benchmark (ICB). The industries with the largest amount of data considered are Consumer Services, Consumer Goods, Industrials, Financials, Technology and Health Care. The data displayed here respects Officevibe’s Terms & Services (article 10.1.1). No personal information was collected (besides an encrypted user ID) and there was no incentive offered for participating in this report. Before you go, save this report for later. Feel free to use any statistics from the State of Employee Engagement. We just ask that you link back to this page if you do.